While filming Weeds last year, I borrowed a Flip recorder to record my makeup transformation into a Black man (African-American doesn’t seem to fit…who knows what I was…). I wanted to edit it and then speed it up, so you could see me go from lily-white to much darker in mere seconds. One problem: I have no idea how to do it. Help? Plug your Flip camcorder into your Mac. By default iPhoto will launch and the Flip camcorder will be selected. (The FlipShare software may also launch but choose iPhoto instead.) Select the clip you want to import and click the Import Selected button. The clip will import into iPhoto. Now launch iMovie ’09. In the Event Library area select iPhoto Videos. Your Flip clip should appear in the iPhotos Videos section at the bottom of the window. Select the clip and drag it up into the Project pane. Double-click the clip in the Project pane and in the Clip tab of the Inspector window that appears, click the Convert Entire Clip button. (You have to do this before you’re allowed to adjust the speed of a Flip camcorder’s clips.) 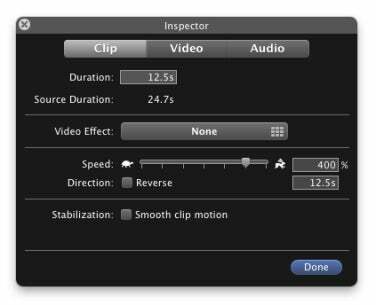 When iMovie finishes converting your clip the Inspector will show a speed control slider in the Clip tab. You can drag this as high as 800-percent. Adjust clip speeds in the Inspector's Clip tab. However, you can make the clip even faster than that simply by entering a higher value in the Speed field. Optionally, you can tell iMovie how long you’d like the clip to play by entering a value in the Duration field below the Speed field—2:00, for example, if you’d like the clip to last 2 minutes. Now just export your project using a command in the Share menu and you’re good to go. Loved the drawer bit with Kevin Nealon, btw.